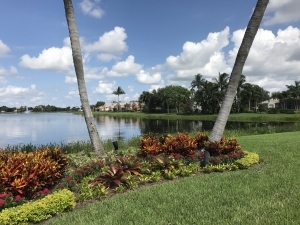 There are many luxury gated communities in South Florida but what makes one stand out from another? An attractive entrance and guardhouse area are important but what the residents and guests see after that can make an even larger impression. 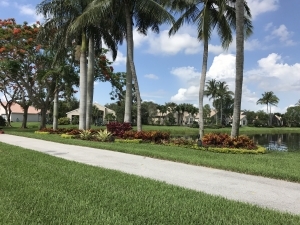 Valencia Isles, located in Boynton Beach, wanted to dress up some of their common areas so that the residents in the 796 single family luxury homes would be wowed as they entered the property. 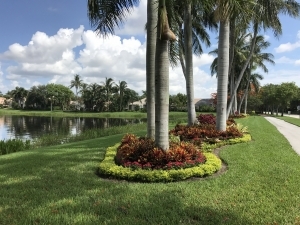 The common areas by the lake were previously open grassy areas pierced by tall Coconut Palms. The Home Owners Association, Property Management Team, Board, and residents desired strong focal points and high impact color instead of the monotonous green. The team at Botanical Visions headed up by Pamela Crawford, Landscape Architect, designed and installed over 500 brightly colored Bromeliads for eye catching color as well as for their unique texture. 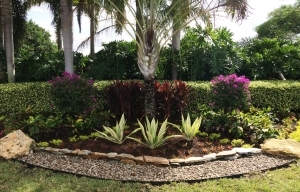 Multi-colored Crotons were selected to compliment the colorful and spiky foliage of the Bromeliads. Surrounding the new beds, we planted a band of Duranta ‘Gold Mound’ to be kept low for a golden border where brightly colored annuals could peak out from behind them. The first rotation for the winter was Dragonwing Begonias followed by Lipstick Pentas for the summer. We also built low stacked stone border walls in accent areas with small open pebble areas to frame the beds. 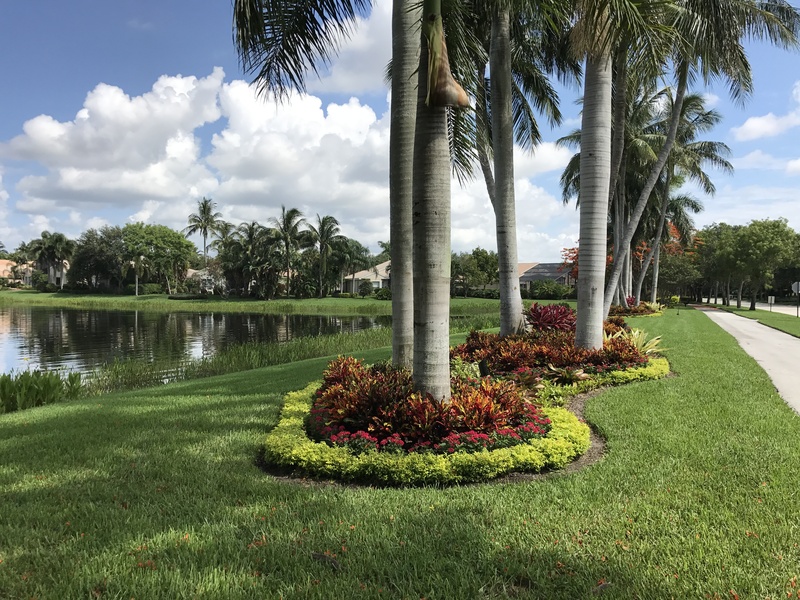 In addition to the community social and recreational activities as well as the close vicinity to shopping, restaurants, and highways, Valencia Isles can now please their current residents and attract new buyers with the enticing new landscaping along their lakes and entryway.